We spent two very pleasant nights beside the sea in La Turballe. The first day was unseasonably warm, causing all our neighbours to comment on the heat and to strip down to the barest essentials. We wandered up into the small town and wandered through the port, admiring the mixture of beautiful yachts and working fishing boats. It was Saturday, so all the cafés and restaurants had tables and chairs outside filled with people relaxing and chatting. It was idyllic. 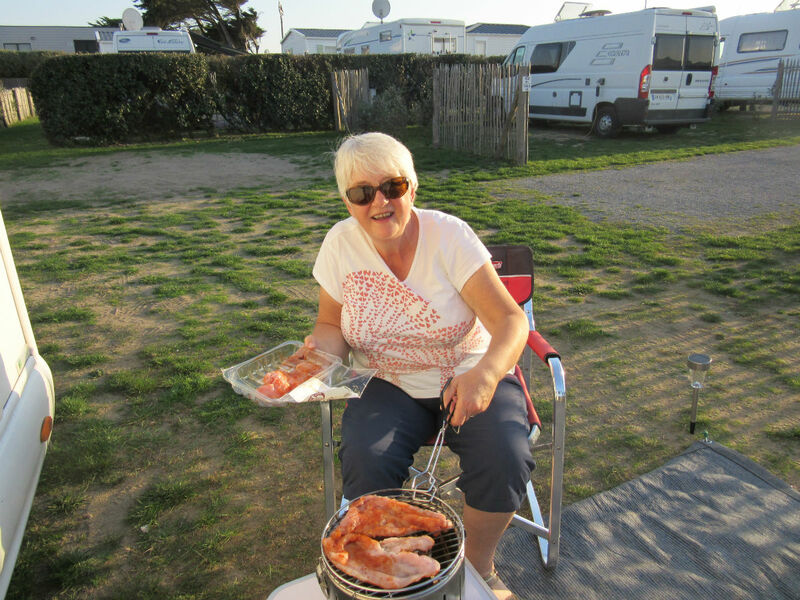 Back at the site Shirley fired up the BBQ and we ate a fine dinner of turkey escalopes with roasted endives and salad sitting outside and congratulating ourselves on choosing the best route through France. After managing to get the slow site wifi to give us some UK television in the evening, we slept like logs. I’m told it’s sea air that does this but a couple of glasses of merlot help quite a lot when you’re only used to drinking one. The following morning was surprisingly overcast but we convinced ourselves that it was an early sea mist and the sunshine would soon return. Being Sunday Bunday we walked up into the town to find an enormous queue at the Boulangerie. It wound its way up along the street – clearly an outstanding cake shop to attract such a crowd. After wandering about looking for a place to buy paté and finding an open Charcuterie, we waited behind a man who spent somewhere in the region of 30€ only to seriously disappoint the owner when we bought a small slice of paté for 2€. Back at the Boulangerie we joined the end of the queue and watched people coming out with beautifully wrapped boxes and arms full of baguettes. I can’t overstate the importance of Sunday Bunday – you see it’s the only day in the week when we eat bread. Having fallen foul of the addictive nature of French bread and its impact on the midriff we now only allow ourselves the pleasure of it once a week. Standing there in the queue we were almost apoplectic with excitement at the thought of both bread and cakes. We don’t eat breakfast on Sundays in order to fully appreciate the delights to come. Going into the shop we were not disappointed. It was my turn to try to communicate in French and I managed quite well with the bread and a lovely pizza type savoury and then I tried to ask for two mille-feuilles. That word is as hard to pronounce convincingly as it looks. The young boy serving me, who had managed by some miracle to keep his face straight thus far, snorted with laughter and then almost swallowed his tonsils trying to look like he hadn’t. I laughed with him and he breathed out with relief and wished us a good day. It really is the simple things that make us happy. As the day wore on, it became obvious that the winds were rising alarmingly and the sea mist was going nowhere. Looking at the BBC weather forecast we discovered that we were on the edge of Storm Ophelia that was heading with some ferocity towards Eire. We had to batten down the hatches and stay indoors for the evening, listening to the sea pounding against the rocks. Time to move on. With an eye on the weather we headed south east in the general direction of the Dordogne, stopping first of all at a lakeside aire de camping cars in the centre of the Vendée region. it was a lovely spot but after walking round the lake and sitting looking at one another we realised we had stopped far too early and would be sitting in a place where there was almost nothing to do for hours. We quickly packed up and set off just five miles to the small town of Vendrennes where the local commune provide an aire just off the main street. We were surprised, when we pulled in, to discover ourselves beside the first British motorhomers we have seen since we first arrived. John and Cath, who have travelled thousands of miles in their motorhome and were currently on their way to Morocco, welcomed us warmly and chatted for a while before we all settled down in our respective vans for the evening. This was when the title of this blog came into its own – perhaps it was all the tales of adventure that John and Cath shared with us, perhaps it was the general feeling that France has gone to sleep after a long summer and nothing much is going on but I uttered the immortal words, “I’d like some excitement. It just feels like we’re travelling from place to place with no obvious purpose.” Shirley looked a bit surprised by this – after all we are getting more excitement than most of our peers – and I forgot all about it. Until the next morning. I woke up to the strange sensation that we were tilted to one side – not much but definitely more than when we went to sleep. Hopping out of the van I discovered a puncture on the rear offside tyre. We carry a full spare wheel underneath the van, hidden behind the bike rack behind a locked hatch. John next door saw me scratching my head and came out to offer to help but there was no need. We are fully covered by European Assistance from the AA – thank goodness. I phoned the helpline for Brits abroad and received pleasant and helpful service from a young Frenchman who spoke perfect English. I gave him our co-ordinates (don’t you love modern technology?) and he told me that the break down person would be there in 45 minutes. Literally 45 minutes later a massive low loader arrived with a mechanic onboard. I asked him if he spoke English and he answered, as always, “Un petit peu”. I told him that I spoke French only un petit peu aussi and so it began. I knew the word for a spare wheel “La roue de secours” (thank you Google translate) but try to explain that it’s in a locker under the van at the back! Eventually I just showed him. At this he suddenly began to speak English “You are lucky you have one” and so it went on. He spoke English when he knew the words and we spoke French when we knew them and Google did the rest. Within half an hour, the spare was on, the nail in the tyre was found and he told us it could be fixed. “Take it to one of the big tyre places en route”, he said and “be sure to get it fixed.” He mentioned that the wear on the tyre was a bit uneven and that eventually we would need to replace both back tyres and then bid us a pleasant farewell. Just before he left I said, “You’re not French are you?” and he laughed and explained that he was Polish but his French is a lot better than his English. It was only his accent when he spoke English that gave him away – the Europeans are so much better than us Brits at this language lark. We were close to the town of Les Herbieres and our trusty satnav told us that there were tyre suppliers to be found there. By now the sun that had been temporarily obliterated by Storm Ophelia was back on full glow and it was hot when we pulled up at Feu Vert. The young man who served us there spoke less English than the Polish mechanic but once again we managed to make some kind of sense of one another, once again running into trouble with explaining where the punctured tyre could be found – behind the bikes, under the back in a locker. No chance – sign language is sometimes the only way. So the bikes and the rack came off again, the locker unlocked, the flat tyre pulled out and taken to the workshop. Moments later our young man was back to tell us that his boss said it shouldn’t be repaired but replaced. What’s more, if we replaced one we have to replace the other rear tyre. Sadly, he told us, we don’t stock these big tyres so you will need to go to Euromaster just down the road. Straight away we decided not to put the offending wheel back in the locker underneath the van and launched it into the van instead, causing some consternation to two small canine passengers. Back on the van went the bike rack, two bikes and all the locks in place before we set off back in the direction we had come to find Euromaster. We arrived at that terrible time just minutes before the place closed for lunch. In France, lunch is venerated and must not be interrupted. The man in Euromaster, who really didn’t speak any English, was abrupt when we showed him our flat tyre and told us that to get two replacements would take until Friday. We sensed that it wasn’t a good time to be asking for anything so we said we would come back in the afternoon. Back we went to the Commercial Centre from whence we had just come but this time we didn’t have to lift the bikes on and off the back. Flunch was calling – a place we usually manage to find an excuse to eat a meal in at least once on these trips. We hit the place just as every worker in the near vicinity arrived to get their meal so it was busy, chaotic and wonderfully cheery. It’s the French equivalent of eating your lunch in a supermarket café and there the similarity ends. I had goulash with unlimited serve yourself vegetables and Shirley had Couscous with three meats. We both chose the mousse au chocolat for dessert and dived in like starving people. It was 1.00 p.m. and we had had no breakfast. An hour and a half later, back at Euromaster we were met by a different man in the same body. It’s amazing what food can do. Charm itself, he told us that we could have our new tyres the following morning at 9.30 a.m. and that the price would be around 300€ for both including fitting and balancing. Off we went back to the same aire that we had stayed on the night before, sat outside in our chairs under the trees and relaxed. The next morning it was raining when we returned to our friend at Euromaster. Of course, as soon as we arrived we had to take off the bikes, the bike rack and the front of the locker to reveal the place where the spare wheel belonged. We then went inside dripping wet to await our new tyres. The nice young man, who was now a close friend, beckoned me out into the car park to ask how to start the van. I warned him that there were two small dogs inside but they were harnessed and he leaned towards me conspiratorially. “We can fix it!” he said. I was puzzled. “We can fix your tyre! No need to spend all that money on two new ones.” We were amazed! Within half an hour and without the dogs even waking up, the van had been in the workshop, jacked up, the old tyre fixed and the spare back in the locker. I paid the bill while Shirley started grappling with the rack and the bikes – 37€!!! Now that we were free to continue our journey, we wanted nothing more than a quiet life. Some hope! Our neighbour John had recommended the town of Jonzac about 140 miles south so we set the satnav and got onto the motorway. I should say something about our new experience of French motorways. While we were at home and dreaming of the next trip, we ordered a French motorway electronic tag that reads your entry and departure from the motorways that have tolls and charges your bank account. This is the modern alternative to hanging out of the window by your feet in a howling gale trying to put money into an unfeasibly small slot at an angle that no human person should have to contort themselves into whilst being hounded by impatient French drivers who know how to do it elegantly. It is an absolute godsend and we go on motorways now just for the fun of it. The bill might not be so funny. Anyway, I digress. We rolled into Jonzac and found the aire de camping cars which was beside a massive school that was just, at that very moment, tipping its contents of adolescents into the street. We rolled up to the barrier and Shirley got out to try to work out how to get in. This is a commercial, paid aire and they want your bank card, your life insurance policy, your sworn statement on a Bible and a rendition of La Marseillese before they will let you in. We failed at the first hurdle and somehow managed to cause the entire system to break down. A kindly Frenchman came to help and ended up phoning the local Office de Tourisme who said they would send someone. In the meantime, another motorhome turned up and I tried my best to explain to the lady that a person from the Tourist Office was on their way but she was sure she knew best so she got hold of the gardener from the nearby park and asked her to help. I was confused by this as I was expecting someone who knew what they were doing from the tourist office and not a lady in wellies, wearing protective gloves. The lady in gloves also called the tourist office and assured us that someone who knew what to do was on his way. By now four motorhomes had turned up and were blocking both the entrance and exit from the school and a nearby campsite. Eventually a man on an electric bike came along and took the back off the machine. As soon as he opened it I realised there was a PC inside and I wanted to shout “Turn it off and on again” but too late. He was on the phone to IT support who said “Turn it off and on again.” By now a crowd had gathered and the situation in the street was close to boiling point with horns blowing, adolescents with adult bodies and children’s minds running about excitedly and a courting couple breaking off their intense snogging every now and again to stare at the ever increasing confusion. At last we were able to put in our details and the gate swung open to let us in, after delivering the longest receipt in the known universe. One of the motorhomes behind us disgorged its passenger who ran headlong up the row of motorhomes to bag her spot in case we got in there before her. We parked next to her, smiling to show that we didn’t want her spot in the first place. Enough adventures for a day or two! And breath, then have a large glass of wine. OMG Margaret, you don’t half know how to have an adventure! I think you should be leading the Brexit negotiations! Try and have an ‘uneventful’ trip from now on lol! Keep writing as I thoroughly enjoy the adventure! Haha! You wanted some excitement didn’t you? Some of us who used the toll tag on our recent French trip are receiving emails (in French) advising our bills are due. I think I used toll roads 3 or 4 times and my bill is about €58. Others have racked up €120! Be warned! ?